Whilst we examine the impact in the UK, the issue is applicable to many higher educational systems, with the total number of international students globally increasing rapidly, and currently standing at 4.3 million (OECD, 2013). English speaking countries have proved to be very popular with international students. The UK ranks second, after Australia, in the percentage of enrolled university students who come from overseas, and second after the US in the total amounts (OECD, 2013). In our study we test whether the increase in overseas students has crowded in or crowded out domestic students, by comparing changes in the number of domestic students and changes in the number of international students within universities over time. This concept is not unlike the approach taken in the literature on immigration and the labour market where researchers look for possible displacement of native workers by immigrant flows (Borjas, 1999, or Card and DiNardo, 2000). However, as is the case with examining labour markets, we must be concerned with outside factors that may affect both the number of domestic and international individuals and so potentially bias these correlations. For example, if a university goes up in the world rankings, or gets a fancy new building, this may lead to an increase in both domestic and overseas students at the same time. To address this issue, we focus on factors that could only affect the number of overseas students. First, we exploit the fact that students from a particular country often follow historical patterns in where and what they choose to study. For example, if Turkish students historically were more likely study physics at university A than university B, then if the total amount of Turkish students increases nationally we expect the number of overseas students to increase more at university A than B. Using this method we find that there is no significant positive relationship between the change in number of domestic and overseas undergraduate students from 2001/2 to 2011/12. 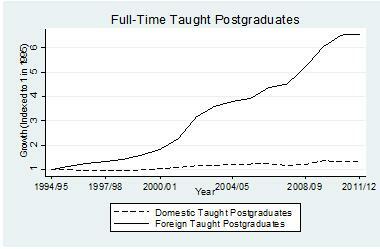 In other words, we find no evidence that an increase in overseas students changes the number of domestic students. However, we do find a positive relationship with taught and research postgraduate students. For each additional overseas student attending a university we see approximately one additional domestic student. This is evidence indicating that universities use the additional fees from international students to subsidize postgraduate places. The second issue we focus on concerns a change in the Chinese visa licensing for its own students, which made it considerably easier for students to self-fund study abroad. These reforms occurred in 1999, and are reflected in the student numbers with the total number of Chinese students doubling each year from 1999 to 2005. 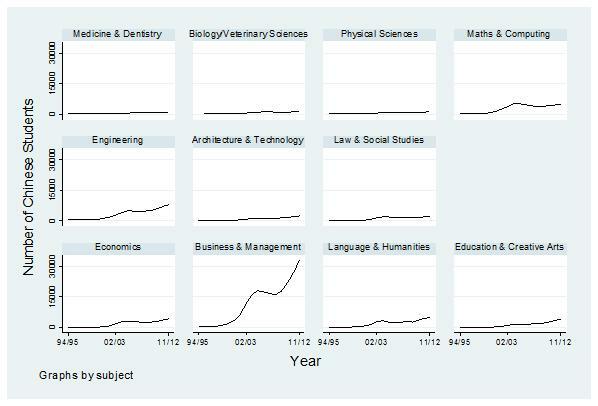 Chinese students also appear to have a strong preference for Business & Management subjects (Figure 2). The number of Chinese students studying these subjects could be counted in 10’s until the late 90’s, but had increased to 15,000 by 2005 and 30,000 by 2012. Thus, if there is displacement or subsidization by overseas students we would expect to see it amongst domestic Business and Management students. In fact, we find the same results as before. The numbers of undergraduates are unaffected, but postgraduate students are positively affected. Why do undergraduates and postgraduate students react differently? The likely explanation is that throughout the period of analysis the UK government imposed strict quotas on the number of undergraduate students a university could take on. Universities could be fined if they exceeded their maximum student allowance. Our evidence is suggestive evidence that these quotas have impeded undergraduate growth. Despite this, the increased number of overseas students combined with their above average fees would still have resulted in higher funding per domestic student. For postgraduates, who had less restrictive or no quotas increases in the number of overseas students in a department is associated with more places being taken up by domestic students. 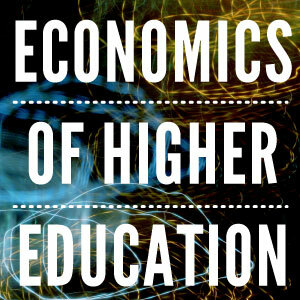 It’s very informative and interesting and useful for higher education students. Please add some more details with the posts.